Variety shows have always been a top choice for Koreans and fans of Korean culture alike. What other time do we get to view a more human side to our favourite actors, idols and comedians than in a show designed to push them to their very limits both physically and mentally, whilst entertaining a diverse audience. They come in lots of formats; from shows which allow us to see the cooking talents of celebrities (Celebrity Master Chef) to the that let us take a look at their physical prowess (Lets Go Dream Team!). However one thing we never get to take a look at is the way in which they interact with their children, something that changed in early 2013 with the release of a new show Dad! Where Are We Going?. Similar in concept to 1 Night 2 Days (1박 2일) with apparent influences of Star Junior Show Boong Uh-Bbang the shows structure is simple but winning: 5 father-child pairs go on mini trips to the countryside together…without the mothers! They are shown completing tasks both together as father and child (picking where they sleep, readying themselves for bed) to separately with the children ‘gathering’ the ingredients for a meal to be cooked by their fathers. Throughout the show however you can feel the strong sense of togetherness that is gained from these small tasks and that could be the beauty behind it. These are celebrity males (many of whom admit that they often spend a lot of time away from their families) and the unscripted rawness of seeing them bond with their children is truly heart-warming to watch. The Oldest Daddy Sung Dong-il and Mature Sung Joon. Popular Sung Dong-il is an actor who in his own right is well deserving of a high amount of respect within the industry. With a wide back catalogue of work that ranges from hit drama The Slave Hunters to the acclaimed Reply 1997 and repute for his solid adlib it is easy to see why fans were excited to see how the all-round professional and fun loving guy would deal with his child when alone. However what came as surprising was just how much difficulty the 46 year old had when it came to relating to his eldest child 7 year old Sung Joon and other two children. From the outset it was clear to see that he was a strict father figure to his children however he later admitted that he worried he lacked knowledge of how to be a father because he himself had been brought up without one due to his own parents’ divorce. The first vacation saw him overcome this worry when both father and son were able to express their love for one another. This has seen them improve their relationship with each vacation, going from walking apart from one another in the first vacation to holding hands on the third. The change in Sung Joon is also noticeable as he seems to be acting more childlike in front of his father, an act that was not present at first as he came across as the most mature and calm of all the children. They have been the first clear case of change in the show and a real highlight for the audience. The Clumsy Daddy Kim Sung-joo and Sensitive Child Kim Min-gook. Kim Sung-joo is a 41 year old MC and broadcaster who has offered his broadcasting talents to roles in dramas in which he has played…a broadcaster! Years as a broadcaster might have given him more leniency to spend time with his children but it is clear that he still has many things to learn. Described as a father who tries to think from his children’s perspectives and tries to understand their feelings it often shows that he would do anything for 9 year old Kim Min-gook and his siblings. However he doesn’t always seem to succeed in understanding how his child feels no matter how hard he tries. From the very first vacation the pair has undergone situations in which they have been made to sleep in less than perfect conditions; from an extremely old fashioned house to a tent. This has seen the sensitive Min-gook (the oldest child on the show) reduced to tears on occasion leaving his father at a loss of how to best calm his son. Regardless of their complications the pair comes across as extremely close to one another and it is visibly clear to the viewers that Min-gook holds his dad in high acclaim. Although Min-gook is a little bit of a ‘cry baby’ it is shown that he can be very mature when it comes to caring for those younger than him and that he is loyal to others. I hope that both father and son continue to grow with the show, Sung-joo with understanding how his son feels and not pushing for perfection and Min-gook with maturing a little more. The Child-Like Daddy Lee Jong-hyuk and Bright Lee Joon-soo. It is easy to see that both father and child have more in common than just their childlike persona as both come across as bright and happy no matter what the situation is often leading to many funny little situations between the pair. Also shockingly this leads to little Joon-soo taking on a more mature character towards his dad reaffirming the latest variety catchphrase. If there is one child on the show that just has to flash a smile towards his father to get his own way it’s clear that it is little Joon-soo also as seen in both the first and second vacation. Let’s hope this adorable little character continues to leave his mark on the public and the strong relationship between father and son grows stronger with time. The ‘Daughter Dummy’ Daddy Song Jong-Kook and Aegyo Princess Song Ji-ah. Retired soccer (football) player 34 year old Song Jong-Kook was part of the wonder team that for the first time in Korean history made in to the semi-finals of the world cup in 2002. Since then people have seen him perform on shows such as Dancing With The Stars Season 2 but this show has seen him in a whole different light from the concentrated man fans are used to…he turns to mush when it comes to his daughter, 6 year old Song Ji-ah. Throughout the show on each and every vacation I have so far watched it is clear to me that he lives to get responses of joy from his daughter, going as far to ensure that he wakes up before the other dads to ensure she eats well in the morning and praising her at every available opportunity. But in all honestly that’s what is so adorable about this father-daughter team. Here we have a daughter who is able to push her dad on no matter what the task is and a father that will ensure that his daughter comes before anything else. It shows that although they both have things to still learn about one another (and this has been shown in episodes) they have a loving relationship on which to base this. If all else fails at least he can sleep safely with the knowledge that this show has helped him find his future son in law in the form of the adorable Yoon Hoo the shows final child. 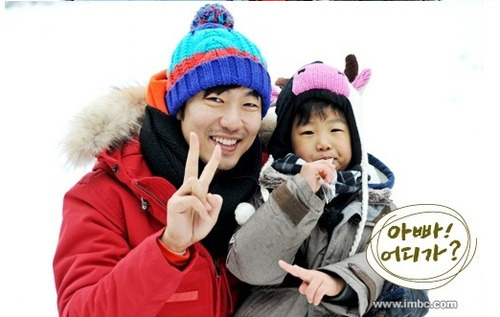 The Young Daddy Yoon Min-soo and Adorable Yoon Hoo. The youngest daddy on the show 33 year old Yoon Min-soo is by no means the least known by the Korean public. Since 2002 he has been a member of R&B group Vibe, a group who since their first single 미워도 다시 한번 (Although it is hateful, again) have been known for their strong vocals cementing their own success within the industry. However for the people who still need help recognising the famous singer, Min-soo ‘graduated with honours’ from Season 1 of MBC’s I Am a Singer ensuring his place in the hearts of viewers. Maybe it’s this same presence that has been passed on to 7 year old Yoon Hoo making him my favourite child on the show and possibly the mascot for it also. The relationship between father and son is not only touching to watch but also funny beyond belief! The way in which Min-soo teases his son about everything he does (especially when it comes too little Ji-ah) is possibly some of the funniest parenting you are likely to see on any show this year. Both seem to have the same lovely and playful personalities that ensure they are a hit not only with the public but also with the other families on the show (when the older Min-gook cries Hoo is often the first one to run to him to check that he is ok). But it’s not just his personality that makes little Hoo stand out…it’s also his appetite. Never before have I seen a child so capable of demolishing an entire plate of food and still looking as though he could finish another in record time! But these are the things that make him such a joy to watch. This show seems to be one that will be a long running one as the ratings have continued to be on the up since the first episode (ratings for the first episode were also high). I hope that it continues to leave a mark as it is certainly an interesting look at the lives of celebrities and their children behind the ‘glamour’ that is shone on them. The innocence and pure love between the families that are shown each and every week makes this show a winner in my eyes and the many others that continue to tune in. What other shows would you like to read a step by step guide to? Leave us your suggestions below in the comment box. I just discovered this show and I adore it! I agree whole heartedly with your step by step guide. The interaction between the children is really entertaining. Mind you, I spend most of my days with 7 year olds any way ( I am a teacher). But there is nothing like seeing children interact with their parents.